Wouldn’t it be nice if you could zoom around town in one of those futuristic vehicles featured in popular science fiction thrillers and comic books? Plenty of people thought we would have flying cars by this point in time. Though we can’t yet traverse the sky in our own floating vehicles (unless you count airplanes), our favorite fictional characters have certainly been traveling from point A to point B with considerable style and speed. Without further adieu, here are the coolest, top fictional vehicles from worlds created by our top artists and writers. Though the Inspector Gadget cartoon series only lasted a couple years, it is quite memorable. Ask anyone who grew up in the early to mid-1980s about this series and he will likely remember Inspector Gadget’s Gadgetmobile. Perhaps the most accessorized fictional vehicle ever created, the Gadgetmobile could do just about anything. It had rockets, an ejection button, the ability to fire sharp tacks onto the road, extendable wheels and so much more. Perhaps the coolest aspect of the Gadgetmobile was the fact that each of its features was voice-operated. Anyone who experienced the 1980s certainly remembers David Hasselhoff’s amazing vehicle in the Knight Rider television series. Known as KITT, this sweet ride was named after the popular series’ original moniker: Knight Industries Two Thousand. KITT could seemingly do it all, from interacting through voice technology to protecting Hasselhoff’s character from danger. KITT is the perfect example of what today’s autonomous vehicle creators envision in a futuristic automobile. KITT could process information with lighting quick speed, observe its surroundings, take over driving responsibilities and even make use of a grappling hook. Featured in comic books, cartoons and movies, the Batmobile is one of the coolest superhero vehicles ever created. The all-black Batmobile is equipped with an array of high-tech equipment including spiked wheels, jet engines and even a slide-out motorcycle. The Batmobile really is the perfect combination of a muscle car mixed with advanced weaponry and specialized gadgets. Some fans have gone as far as modifying their own sports cars to resemble the Dark Knight’s unique ride. If you have read Stephen King’s novel Christine, you were probably awe-struck by the vehicle at the center of the story. The 1958 Plymouth Fury purchased by Arnold Cunningham turned out to be anything but a regular vehicle. Dubbed “Christine”, the car certainly had a mind of its own. It locked occupants inside, sprayed noxious exhaust fumes and generally wreaked havoc on anyone in its way. If you haven’t yet played Mario Kart 8, you are missing out on what is being called the most enjoyable racing video game ever made. The Master Cycle was made available in a downloadable content pack following the game’s release. Its front end is a protruding horse neck and face while the body is partially covered by Link’s signature shield. Give the Master Cycle a chance and you won’t be disappointed. Hop online for some worldwide racing and you will undoubtedly spot plenty of players riding along on this powerful and sleek motorcycle. Just about everyone has seen or heard of the Back To The Future movie series. 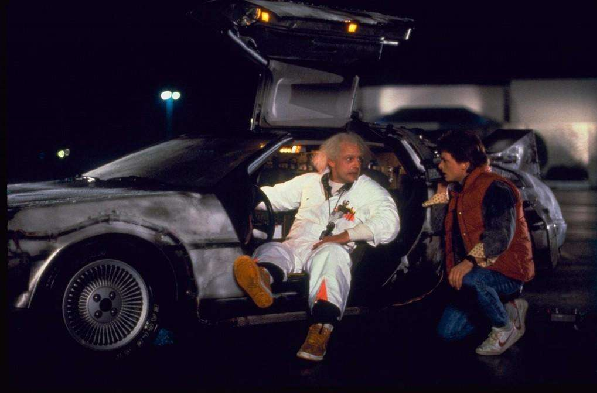 Doc Brown turned a seemingly normal DeLorean into a time traveling vehicle that he and Marty McFly used to transition between periods of history as well as the future. The DeLorean’s time travel abilities hinged on a doctored flux capacitor that allowed the vehicle to reach the rate of speed necessary to travel through time. The vehicle certainly had aesthetic appeal thanks to its unique roof-connected doors that opened upwards rather than outwards.